When you are running your own business, you will inevitably have to deal with some electrical work for your office one way or another. When that time comes, it is best to hire professionals rather than doing it on your own. It is important to handle electrical issues properly to avoid more damages and bigger problems. Not only will that affect your properties and equipment, but it could potentially hurt the production of your business. The best way to handle electrical concerns in the office is by finding the best commercial electrical service provider in your area. Our company – Pokolbin, Branxton & Newcastle Electrical – has a team of licensed and experienced electricians who can provide your company with a wide range of commercial and industrial services such as installation, design, and maintenance. Because we understand how important your business is to you, we make sure to deliver high quality work promptly at a cost that is well within your budget. We are committed to giving our clients the best possible electrical services. We ensure that our electrical technicians are reliable, responds quickly, and has sufficient know-how in the field, making them the best option for the job. Different tools and equipment are needed when doing commercial electrical work, whether it be an upgrade or installation of new machines or systems. Our company makes sure that all our tools, gears, and equipment are safe to use and has no defect that could cause problems. Our team of electrical contractors are well-versed in using the different power tools and hand tools needed to address the electrical issue. Our electricians are honed by experience in the industry and are exposed to the different methods and techniques in dealing with your commercial electrical concerns. With our licensed professionals, you can be assured of an efficient and first class electrical service. Our team works hard in providing you with top-notch customer service. We are on call 24/7 and we ensure fast response time. Through meticulous planning, efficient implementation, and open communication with our clients, we always deliver commercial electrical services that is more than your money’s worth. 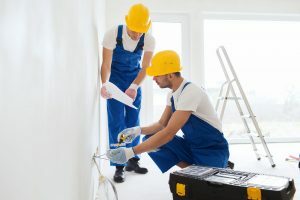 Our electrical experts are not only skilled and experienced, but they are also updated with the most recent electrical techniques and systems. They have sufficient knowledge about automation and business management systems like Programmable Logic Controller and also Supervisory Control and Data Acquisition. By hiring us to do your automation projects and management system installation, you can have your business running smoothly in no time. Our responsibility does not end after the completion of the project. We also provide our clients maintenance services, routine testing, and regular inspection to ensure that your electrical system is in top condition at all times. For your commercial electrical needs, call us now or enquire here through our contact page.